Curiosity, diversity and a firm focus on the music itself characterize the artistic work of Jean-Guihen Queyras. His approaches to early music – as in his collaborations with the Freiburg Baroque Orchestra, the Akademie für Alte Musik Berlin and the Concerto Köln – and to contemporary music are equally thorough. He has given world premieres of works by, among others, Ivan Fedele, Gilbert Amy, Bruno Mantovani, Michael Jarrell, Johannes-Maria Staud and Thomas Larcher. Conducted by the composer, he recorded Peter Eötvös’ Cello Concerto to mark his 70th birthday in November 2014. 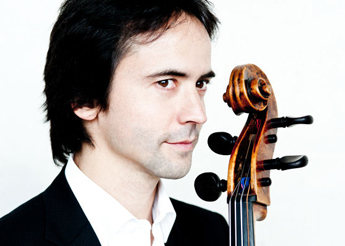 Jean-Guihen Queyras is a founding member of the Arcanto Quartet and forms a celebrated trio with Isabelle Faust and Alexander Melnikov. The versatility in his music-making has led to many concert halls, festivals and orchestras inviting Jean-Guihen to be Artist in Residence, including the Concertgebouw Amsterdam and the Festival d’Aix-en-Provence, Vredenburg Utrecht, De Bijloke Ghent and Wigmore Hall London. Jean-Guihen Queyras often appears with renowned orchestras such as the Philadelphia Orchestra, the Symphonieorchester des Bayerischen Rundfunks, the Philharmonia Orchestra, the Orchestre de Paris, the NHK Symphony Orchestra, the Gewandhausorchester and the Tonhalle Orchestra Zurich, working with conductors such as Iván Fischer, Philippe Herreweghe, Yannick Nézet-Séguin, Jiři Bělohlávek, Oliver Knussen and Sir Roger Norrington. Jean-Guihen Queyras’ discography is impressive. His recordings of cello concertos by Edward Elgar, Antonín Dvořák, Philippe Schoeller and Gilbert Amy have been released to critical acclaim. As part of a Harmonia Mundi project dedicated to Schumann, he has recorded the complete piano trios with Isabelle Faust and Alexander Melnikov and at the same time the Schumann cello concerto with the Freiburg Baroque Orchestra under Pablo Heras-Casado. "THRACE - Sunday Morning Sessions", his latest recording, was released in August 2016.